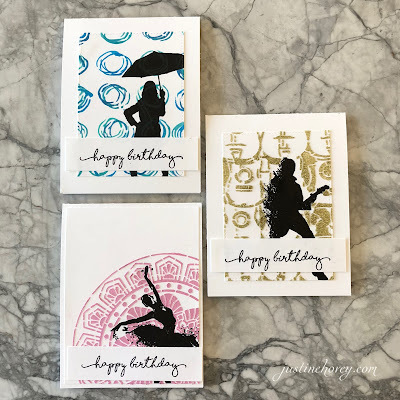 Today I am guest designing for StencilGirl and showing you three different ways to create clean and simple cards with glitter paste, stencils, mousse and inks. 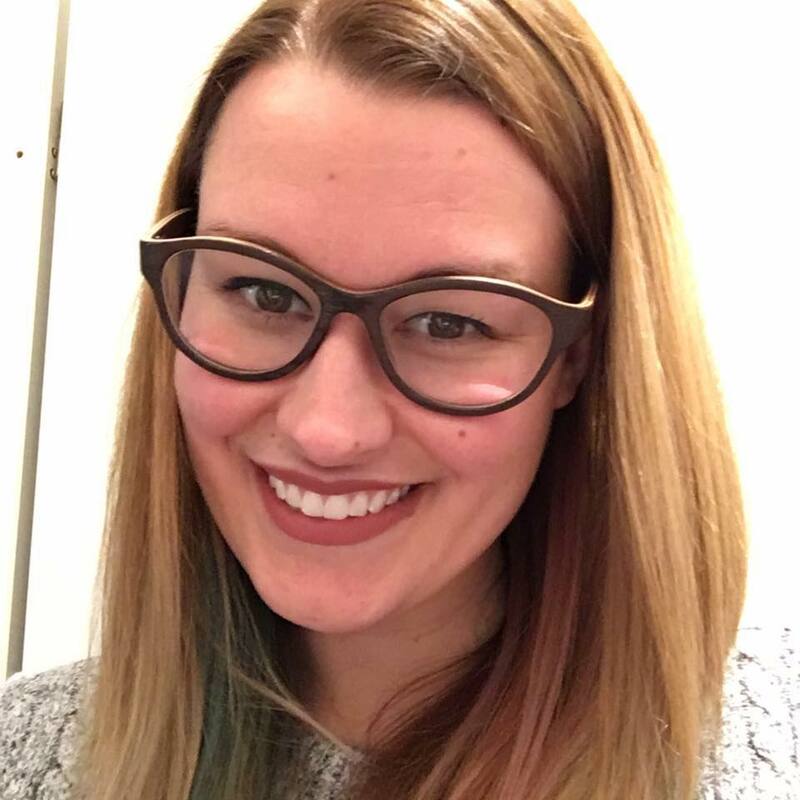 Before we get started, let me introduce myself! 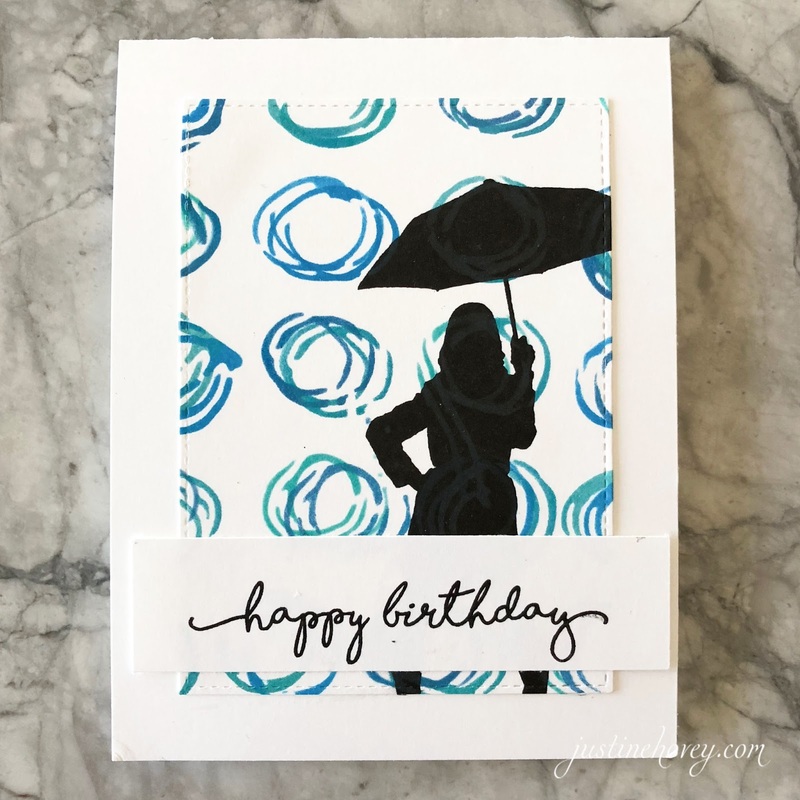 I’m Justine from justinehovey.com and I specialize in easy to make cards. I have been crafting for over 10 years and enjoy teaching card making techniques on my YouTube channel. I live in Thunder Bay, Canada and enjoy reading and traveling when I’m not in the craft room. I created a video tutorial showing you everything you need to know about creating these cards. 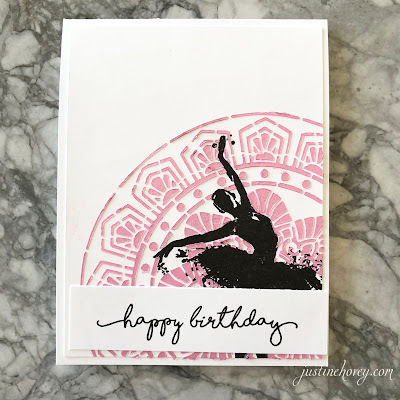 For the first card (which is my favorite from the bunch) I used some pink Nuvo Mousse to spread over the Art Deco Medallion Stencil. In order to avoid the ballerina stamp, I had to mask off the image before applying the mousse. For this card, I did the same technique as above however I used gold glitter paste instead of mousse which has a totally different texture when dry. This is more rough and gritty than the previous card. I have trouble with masculine cards but I sure do love this one! 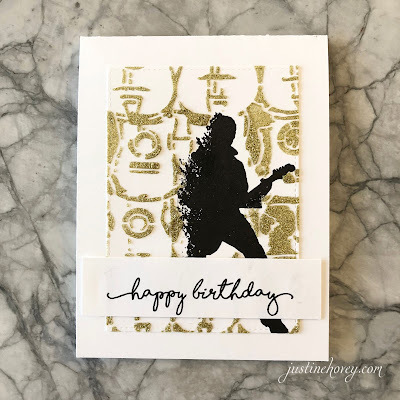 The Small Guitar stencil is perfect for any music lover! 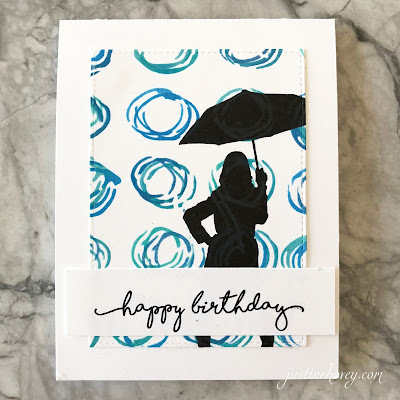 For my last card, I used my Distress Oxide inks with the Inky Circles Stencil. I wanted to add some more depth to my card so I layered up the stencil twice. I like that the stenciling shows through the image a little bit after I stamped it. If you don’t like that, you will have to use regular Distress inks or mask the image. Thanks so much for checking me out today. If you like what you see, please subscribe to my YouTube Channel, FB Page or Instagram @justinehovey. Love these cards. These stencils make fun backgrounds. You ROCK Justine! Great cards, Justine! Love the guitar one especially. The image reminds of Elvis! These are just lovely, Justine. Love how you used the stencils. Love these cards! 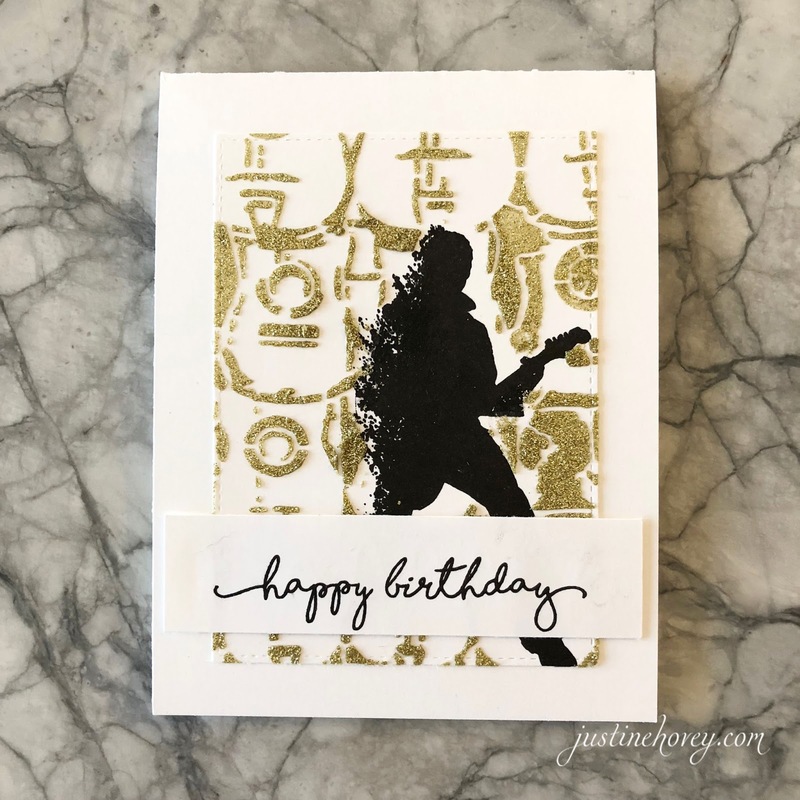 I ended up making the guitar card for my husband. I couldn't find the gold glitter paste. I had molding paste - added gold paint and glitter. Turned out okay - but not as glittery. Where did you get those supplies?